Here we are again. A new year has started and we’ve all put on some happy Holiday weight. The parties, extravagant desserts and cocktails have taken their toll, and while worth every calorie, the time has come to say goodbye. Don’t sit at home wrapped in a blanket with your fuzzy slippers. Start slimming down with sushi as the new year begins. Natsumi (226 W 50th Street) While Natsumi looks downtown hip and trendy, the food offers traditional preparations. The menu is best described as Asian fusion with an Italian flare. They throw in Italian inspired selections like Green Tea Gnocchi and New Style Carpaccio with basil that are very unique. I visit for the fresh fish and tender dumplings. I recommend specialty rolls like the Natsumi Roll with tuna, spicy tuna, avocado, apple and basil and the Gold Leaf Roll topped with mango, spicy tuna and salmon ($18.75). Old standards like Spicy Tuna ($7.75) and Yellowtail Scallion ($7.50) Rolls are economical additions to your feast. They offer specials of Three Rolls for $22 and Daily Selection of Seasonal Best for $29 as well. It’s located near Times Square if you’re visiting and commuting through that part of town. Tomoe Sushi (172 Thompson Street) Tomeo brings fresh sushi and fast service to a casual setting. The menu is massive with tons of options in both cooked fish and sashimi. I like to start with a Garden or Seaweed Salad to help fill in the cracks ($4). The Sushi Lunch Combination has assorted seven pieces of sushi and half a tuna roll for $17.75. Rolls range from $5-$14 and sashimi pieces start at $4. They don’t offer complicated specialty rolls and aren’t pretentious in any way. The Sushi-Shashimi Combination includes ten pieces of sashimi and five pieces of sushi plus half a spicy tuna roll for $35. They don’t take reservations so expect a short wait, not usually more than ten minutes. IchiUmi (6 East 32nd Street) This pick may seem to go against eating less in the new year, because IchiUmi is an all-you-can-eat restaurant. They deliver a quick way to have healthy food especially at lunch time. Until 3:30 p.m. lunch is $18.95 and from 4-10 p.m. dinner is $31.95 and $34.95 on weekends. The smorgasburg offer tons of vegetables and salads and sashimi choices like red snapper, scallop and branzino. It’s a great bang for your buck as long as you keep your portions under control. You can even cook your own seafood for a perfectly healthful meal. 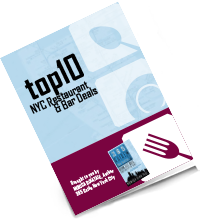 365 Guide New York City is available on Amazon in paperback and ebook and is full of restaurant deals and bar specials in NYC. Monica DiNatale is Deals Expert and author of "365 Guide New York City" which is full of restaurant deals and bar specials in NYC. Her weekly column in Metro NY “Drink. Eat. $ave. NYC” is the source for deals in The Big Apple. Paperback and ebook are available on Amazon. Love $aving in NYC? Get ﻿m﻿ore deals!